It seems impolite to put it to Olivier Giroud that his struggles to get a shot on target at this tournament are only marginally worse than Jack Charlton was in 1966. But that’s the cold, hard truth. The France forward has has failed to get any of his 13 shots on target at the tournament – a record which is equal to Poland’s Zymunt Maszczyk in the 1974 finals and North Korea’s Seung-Hwi Im in 1966. Charlton’s tally was 11 off target in ’66, the year from which records are available. The 31-year-old is willing to discuss the absence of what every striker would consider a necessity, though. In the Belgium semi-final, his six shots were either off target or blocked and when Kylian Mbappe’s sublime ‘shuffle’ promised to create a goal to be replayed for decades, he could not add the finishing touch. 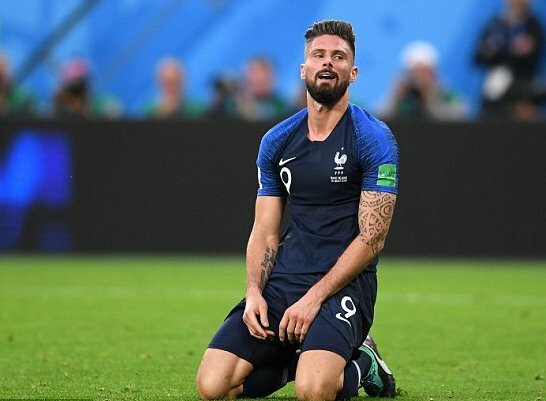 None of which erases the fact that Giroud is not delivering what strikers are paid for – and that Mbappe’s electrifying World Cup has provided cover for that. Deschamps, who did not start with Hiroud in the opening game against Argentina, has also found a better blend when he does start, with Mbappe and Griezmann running off him. The French remember striker Stephane Guivarc’h not scoring a single goal when the team won the 1998 World Cup. ‘We are not favourites,’ Paul Pogba said on Thursday. ‘We haven’t forgotten the doubts about us that there were at the beginning of the competition – about our ability to play together. We want to go and get something, we will do everything for. Giroud has endured enough criticism for enough years to remain steadfastly optimistic. ‘In 1998 Guivarc’h played a good World Cup,’ he said. ‘After the  semi final when we won against Germany we were a bit euphoric, whereas against Belgium it was different. It’s not the same feeling. We know we still have one game to win. We’ve come a long way to get here and we don’t want to waste this opportunity now.